Ok, I want to create a game. I select players, and I go to select a template, and I can only choose the small earth generic map. I have tried things, and nothing works. I've tried pasting a link to a past game with the map I want, but there is no "enter" button. Nothing happens when I hit enter. I have searched for how to do this, and I get a lot of info on how to create a map, not how to create a game. A wiki how "help" I got a page, and it did not have detailed instructions. It said to select a map. well the map is not there for me to select. How do I get a list of all available maps? What is the process for selecting an existing map? I see a setting "my saved maps" but how do I save a map from a game I have played? 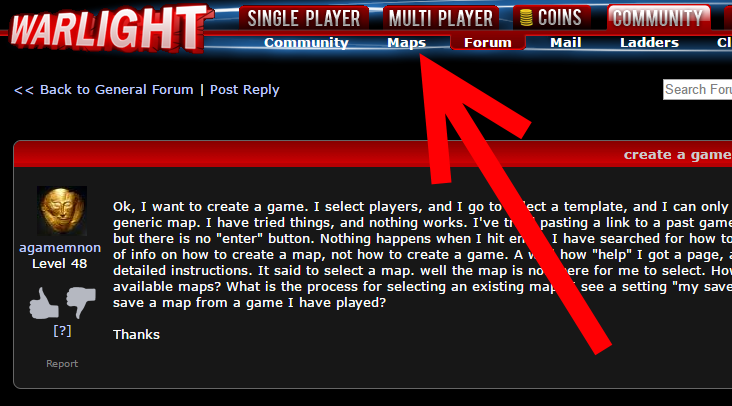 Easiest way is to click that Maps link, select a map, then click one of the "Start a game on this map" links. You can favorite some maps so that they appear under the section of Favorited Maps in Filter by Category. If you know name, select All Maps-and search by name. Ok, so here is where I think you are going wrong when using create games. First, you are able to reach the page below right. Then you can only select the 'predefined' templates. As shown in the gif. Now, if you look next to the drop down, at Customize Template, and check that box. Then you can create any* game with any* settings. Also before reaching this step, you should have the option of selecting 'Custom' which basically is the same thing as Customize a template, except that a template starts with other default settings, depending on template. Tbest....please link to info on how to do whatever you just did...to be able to use videos like that would be so great in my job. Download the thing from there. It works as advertized. TBest, so even in your little video there, when you pull down the box and click on a topic, there are NO maps. I want to play "United States Big". so as Fizzer said, I had to go to "maps" not "Create" because create, does not create a game with an existing map, it only has those templates for the generic small world. Thanks Fizzer, that's working for me.